Once the OMR sheets are scanned and processed, the OMR software generates results in the desired format. The output of the generated result can be in various forms as selected by the user. The user can opt for mark list which is a regular column wise result or can go for graphical representation. 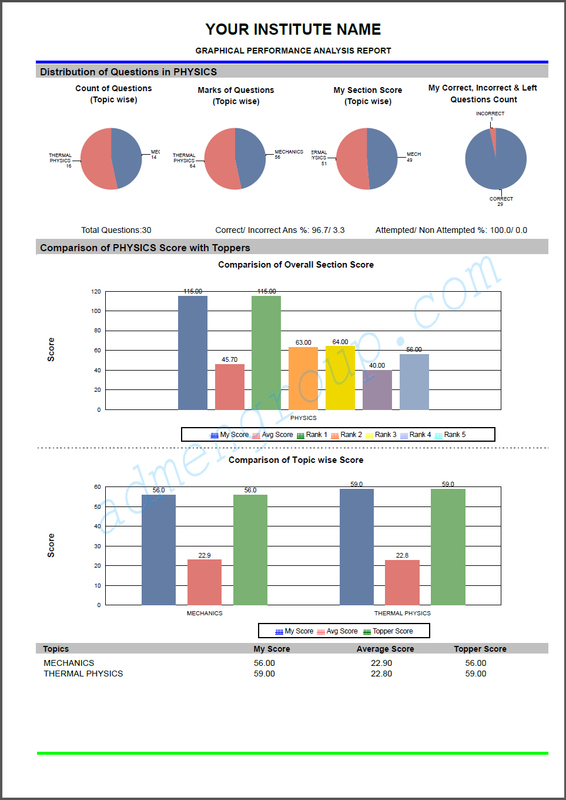 Graphical representation of test results can give you a detailed report as compared to column wise mark lists. Graphical test results are displayed in the form of bar and pie diagrams. The performance and the status of a student can be easily analyzed by comparing their scores with maximum scores, average score, etc. Mark lists are generally displayed on the notice board. But displaying mark lists of thousands of students on the notice board is not possible. Also, graphical reports of individual students cannot be displayed on the notice board. Since the OMR software creates PDFs of graphical reports of each student separately, it can be easily uploaded on the website through the Online Test Software. Addmen OMR software provides an inbuilt feature to generate and upload OMR test graphical result online. Using this feature, students can use their login credentials to view their test reports in graphical form. Else, it can also be sent to them via email.